Dates for a West Asian Football Federation (WAFF) Championship have been announced. The tournament which was once a pretty regular centerpiece of the football in the region, was slated to be held in 2016. Participation had been at all-time high in previous tournaments (the 2012 tournament featured 11 teams) but Iran withdrew to become a founding member of the Central Asian Football Federation. In 2014, Syria and Yemen withdrew due to the crumbling political situation in their respective countries while the lion's share of teams competed with disinterest (goalless draws were a regular feature). That 2014 tournament was a horrible harbinger for all involved. 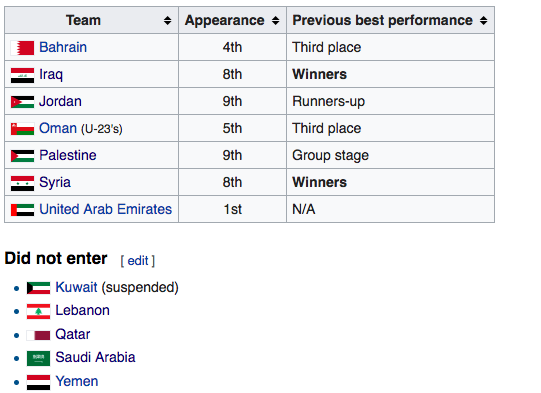 None of the nine sides advanced past the group stage at the 2015 Asian Cup and with the sheer awfulness of the 2014 edition in the back of everyone's mind there was no rush to see another edition. With World and Asian Cup qualification in the bag for the participating nations. The tournament is back and it will feature seven nations-the lowest number of teams since the inaugural tournament. This time however, Palestine will not be sending their first choice side. In their place, the Olympic side will contest the fixtures giving an opportunity for a lot of the new faces in the side to stake their claim. Syria and Oman will also send their Olympic sides. Chances are Palestine could also invite Ahli Amman duo Mohammed Balah and Mahmoud Wadi to further prepare them for the full national side.